Under Sec. 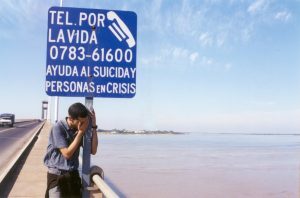 22.08 of the Penal Code, is it a crime to aid another in suicide. That crime is defined as “(a) A person commits an offense if, with intent to promote or assist the commission of suicide by another, he aids or attempts to aid the other to commit or attempt to commit suicide. (b) An offense under this section is a Class C misdemeanor unless the actor’s conduct causes suicide or attempted suicide that results in serious bodily injury, in which event the offense is a state jail felony.” Thus, you could face 180 days to 2 years in jail for aiding in the suicide of another, even if they are unsuccessful but hurt themselves severely. However, the Penal Code does not define “aiding” so a jury would have to use the common meaning of the word. At common law, aiding and abbetting rendered a person guilty as a principal in the second degree. It consisted in being present at the time and place, and doing some act to render aid to the actual perpetrator of the crime, though without taking a direct share in its commission. Under this definition, Ms. Carter could and would not be guilty of assisting suicide. Under Webster’s dictionary, aiding is defined as 1) transitive verb: to provide with what is useful or necessary in achieving an end aid a cause aid a friend, and 2) intransitive verb: to give assistance research that aided in the discovery a new drug. Here, Ms. Carter only gave mere words of encouragement. She did not provide any pills or poison gas, or help at the scene or give him a gun. It would be a stretch to say here words were useful or necessary in achieving the end. Her words, as awful as they were, do not likely fit any Texas homicide or suicide statute. She may fit under a harassment or stalking statute, but that is a story for a different day.